I'll admit it. Growing up, I was a true blue Gap guy. This was prior to the Old Navy years, when the Gap was all about simple, stylish, affordable clothes. Then came along the Gap that ironically was trying so hard to not be Old Navy, while doing everything it could to be Banana Republic. It wasn't long until the Gap became a bland, soulless brand. I even let a couple of years slip by without ever stepping into a Gap store. Then their logo debacle went down. I decided to see what the Gap had been up to. Stuffed in the middle of a rack, I discovered a denim shirt (technically it's a chambray shirt) that was reminiscent of the clothes the Gap was creating back in its heyday, circa '92. It was new, but old. It was dressy, yet casual. It was perfect and flawed. I had to have it. I can honestly say it's become my favorite article of clothing. I've worn it to business meetings on Madison Ave. and I've crashed in it for a Sunday afternoon nap. It literally goes with everything—shorts, suits, slacks and selvedge. If the Gap simply took a look at this particular product and began patterning other articles of clothing after this concept—they'd be able to both simplify and grow simultaneously. Think about it, the perfect khakis, the go-to sweater, the wear-anywhere jacket. 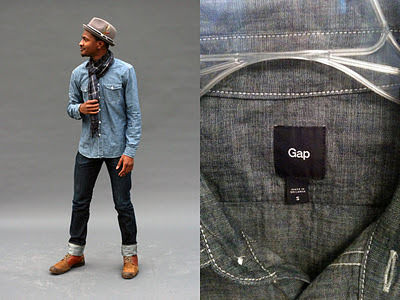 The Gap simply needs to focus on clothes with character. And let's face it, if they had just redesigned their logo to match this tag, they'd probably have been good to go. Agreed on pretty much all counts. Though I think, in addition to style, the "slim fit" business has to end. I was in a Gap (and in a mall) for the first time in at least a year over the weekend. Found a shirt I was rather taken with, only to try it on and realize it was a slim fit. Which meant that, even upping sizes, the sleeves were so tight on my arms that they probably could've doubled as blood pressure cuffs. 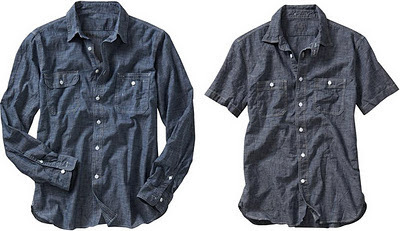 If it had fit like a normal shirt - like any of the several shirts I've purchased from Gap over the years, I'd have bought it, but I want to wear clothes that are comfortable, not stuff that would be snug on the most emaciated of hipsters. Yeah, I definitely think that sizing would need to be a big part of their consideration set. Under the notion that they'd simplify their selection by creating 'best of' each type of apparel, they could definitely go broad on the size offerings. One of the things that makes this chambray shirt of mine so amazing is that it's beyond comfortable.